The MOYA or Museum of Young Art in Vienna is not only one of Vienna′s youngest museums, but also a museum with a particularly young spirit: It is dedicated to the most contemporary art, work from the 21st century, made in Europe. The museum is operated by Kolja Kramer and has the feel of a gallery: different artists from all European countries are presented. 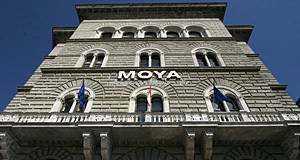 Interestingly, the MOYA is situated at the Löwelstraße - most Austrians recognize this name, because it is here where the Social Democrats have their national headquarter. Past and present meet and greet. The Löwelstraße is a small street with essentially only a hand-full of houses, all of them pretty legendary: The Café Landtmann, the Museum of Young Art MOYA, the Social Democrats′ headquarter, the second Palais Liechtenstein (not the one with the art museum, that would be in the ninth district) and - on the other side - the Burgtheater theatre. That′s pretty much it. The understanding of art that is presented in the MOYA spans from the most contemporary works in painting, sculpture and graphic art to installations, digital media, photography, video and other means to express artwork. The galleries are situated in a 19th century Gründerzeit piece of ugliness, an amusing - and intentional - contrast to the contents of the building. Criticism at MOYA is primarily targeted at its commercial feel: All facilities are rented out for meetings, conferences and receptions. Attractions nearby - and beyond those mentioned above - include the Hofburg, the Ballhaus, the Houses of Parliament, the Rathaus and Vienna University in the immediate vicinity. The Minoritenkirche and Palais Ferstel with the Freyung Square are within easy walking distance. Art aficionados might want to go to the BA-CA-Kunstforum, the Albertina or the Kunsthistorisches Museum; all three venues are within a 10 minute walk from the Museum of Young Art.